The right entry door can improve your home's curb appeal and make a great first impression. Home Solutions Midwest installs replacement exterior doors from ProVia. These doors are made with the highest standards and offer you greater beauty, security and energy efficiency. We provide you with the best quality products so that you will never have to worry about replacing your door again - unless it's by choice. Our professionals will handle your entire project from start to finish – from helping you choose the right type of door to the actual installation. Call us today at 1-844-665-0388 or click below to request your free, no-obligation estimate for door replacement. This home had its outdated front door replaced with a new Provia Entry Door. If you want to improve the look of your home by installing a new door, call Home Solutions Midwest for an estimate today! New Provia Patio Door Installed in Forest City, Iowa. New Provia Entry Door installed in Northfield, MN. ProVia offers an assortment of aluminum storm door options and colors to customize for your homes appearance and functional needs. Spectrum: Spectrum storm doors feature retractable top and bottom screens and come in a wide variety colors. You can choose from a number of screen sizes and placements as well. Decorator: Decorator doors provide a unique style to your entry door, including a full size pane. We offer several different colors as well as art glass to help you get the right design. Deluxe: Deluxe doors offer improved lighting, ventilation, and weather protection for any home. With a variety of colors and pane sizes, you can choose the right style for your home. DuraGuard: DuraGuard provides a heavy duty stainless steel screen that still allows ventilation but eliminates the worry of pets or children damaging the screen. These doors come with a variety of color and pane size and placement options. SuperView: Superview doors offer a sleek finish designed to maximize light and air flow. With several styles and colors available, you're sure to get the perfect door for your home. Finding the right door for your home is part of the process, but no door looks complete without the right finishing touches. Adding decorative or privacy glass, transom windows, and sidelights are all great options for improving the look of your door and giving you an eye-catching entryway. Schedule your free door replacement estimate today! Our doors are custom ordered to ensure a perfect look and fit every time. 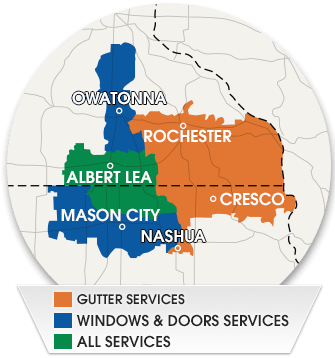 Contact Home Solutions Midwest today to learn more about our window and door replacement options. We offer free design consultations and estimates in Owatonna, Winona, Faribault, Austin, Northfield, Albert Lea, Farmington and the surrounding area.